James Cleland (1770–1840) was a Scottish statistician, known also as a historical writer. He was a native of Glasgow, and began life as a cabinet-maker, spending some in London. During his year as a Glasgow baillie in 1806-07  Cleland prepared a report on the structural problems of the Episcopal chapel, St Andrew's-by-the-Green. He obtained in 1814 the post of superintendent of public works in Glasgow. In 1819 he was employed by the municipal authorities in taking a census of Glasgow, the most ambitious in the United Kingdom. He was similarly employed in 1821 and 1831. The "Cleland Testimonial" at the corner of Sauchiehall Street and Buchanan Street, Glasgow. 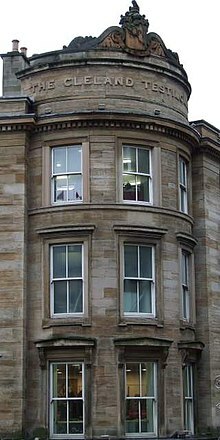 The "Cleland Testimonial" building in Buchanan Street, Glasgow, was designed by David Hamilton and was completed in 1836. James Cleland lived there at the end of his life. It is now a category B listed building. Annals of Glasgow, Glasgow, 1816. Rise and Progress of the City of Glasgow, Glasgow, 1820. Enumeration of the Inhabitants of Glasgow, Glasgow, 1832. Historical Account of Bills of Mortality of the Probability of Human Life in Glasgow and other large towns, Glasgow, 1836. Description of the Banquet in honour of the Right Honourable Sir R. Peel, Lord Rector of the University of Glasgow, 13 Jan. 1837, Glasgow, 1837. Description of the City of Glasgow, Glasgow, 1843. "Cleland, James" . Dictionary of National Biography. London: Smith, Elder & Co. 1885–1900. ^ James Cleland (1816). Annals of Glasgow. p. 179. ^ Glasgow City Archives, TD423/1/2, St Andrew's-by-the-Green Minute Book, p. 27. ^ Raymond McKenzie; Gary Nisbet (2002). Public Sculpture of Glasgow. Liverpool University Press. p. 46. ISBN 978-0-85323-937-6. Retrieved 1 May 2012. ^ Historic Environment Scotland. "249 Buchanan Street and 1-7 (odd Nos) Sauchiehall Street "Cleland Testimonial Building" (Category B) (LB33006)". Retrieved 25 March 2019. This article incorporates text from a publication now in the public domain: "Cleland, James". Dictionary of National Biography. London: Smith, Elder & Co. 1885–1900.